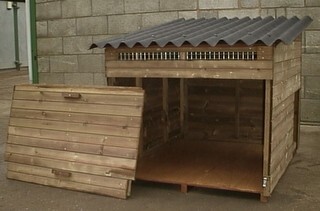 Our wide range of goose and swan houses are designed to accommodate various different breeds of geese and swans. As breed sizes vary so much, we do not list a recommended number of waterfowl for each house, but if you would like advice on which size house you will need, please telephone us to discuss your requirements. All our poultry houses are manufactured in the UK to very high standards and are built robustly. Some of our ranges are available in a choice of colours and we also offer a bespoke service.